Just when you think you’ve learned all there is about mortgages; someone asks you if you’ve ever considered recasting. What in the world is that, you wonder? Should you consider it? Is it something you need to do? And where can you find the answers for all of these questions? In this blog post we’ll explain recasting, why someone might want to recast, and alternatives to recasting. Like most financial options, what works for you might not work for someone else. But it’s easier to determine your best path when you have all the information. So read on! Recasting means the balance of a mortgage is re-amortized over the remaining term of the loan. Sounds confusing – but think of someone who’s paid a lump sum amount off their mortgage, in addition to their regular payment. If they pay down the balance and continue making their payment, the loan will pay off early. Or they might elect to recast their balance. By recasting the balance, the loan will pay off on the date it was initially scheduled to pay off – and the monthly payment will decrease. Not all lenders and servicers offer or allow, recasting. There’s a good chance you can if your loan is a Fannie Mae or Freddie Mac owned conforming loan. However, if you have an FHA or a VA loan – you won’t be able to recast your loan. If you have a jumbo loan balance, make sure to check with the mortgage lender, or the servicer you make your payments to, to see if they offer to recast. The one main requirement before you can recast a mortgage is that you pay down a Lump Sum on your mortgage. Most lenders will have a threshold of 20% of your original mortgage balance. However, it can’t be an accumulation of the regular principal reductions from your regular monthly payments. Making those reductions monthly keeps you on track to pay off the mortgage on schedule. Some lenders do allow recasting even with less than 20% of the lumpsum payment towards the principal. You’ll also likely pay a fee as part of the recast. The lender or servicer will tell you the amount when you contact them about recasting your mortgage. Make sure to contact them before, and not after, you pay down the mortgage balance! You won’t be able to get money back without going through a full cash-out refinance. The result of recasting a mortgage is a smaller monthly payment. Controlling your monthly cash flow by reducing a significant bill is very attractive. If you struggled to get into a home and make the payment every month, then reducing the monthly payment can be the answer to your dream. Also, by recasting your current mortgage, you keep the interest rate you were lucky enough to secure with the original mortgage. It’s more than likely we won’t have access to rates that low again. 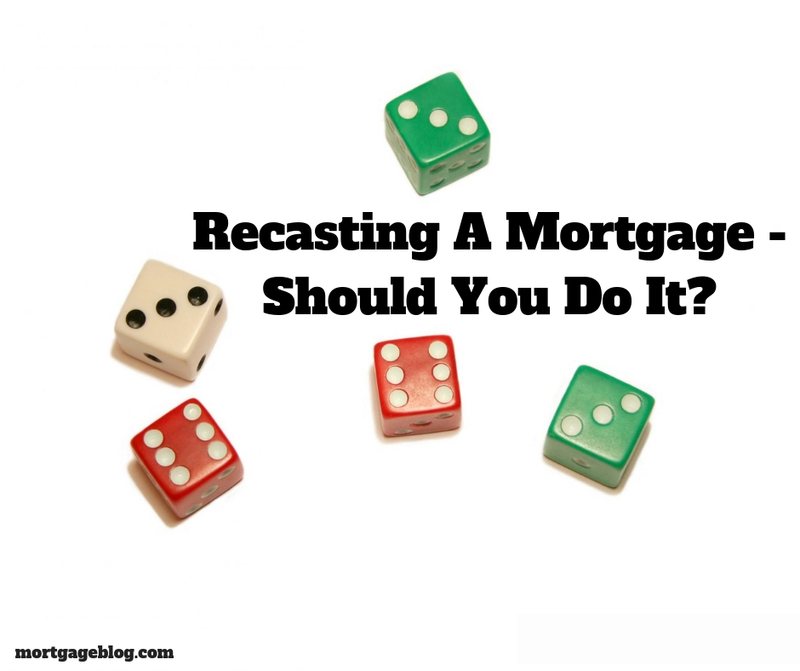 The alternatives to recasting are to either refinance your mortgage or sell your home and buy another with a new mortgage. Refinancing allows you to change the loan program from the one you have currently. For instance, changing an adjustable rate mortgage and to a fixed rate – or the reverse – a fixed to an adjustable. To take money out of the equity in your home, you’ll also need to go through a full refinance. The process of a refinance requires that you qualify for the new loan all over again – regardless of your repayment record on your current mortgage. A refinance also carries the same closing costs as a purchase loan. While recasting your existing loan doesn’t allow you to pull equity out – you don’t need to qualify or pay large amounts of fees. Remember, once you put funds into paying down your mortgage, you won’t be able to access those funds unless you qualify for a cash-out refinance, or sell your home. If you have other high-interest rate debt, such as student loans, or carry high balances on credit cards, the extra funds will be put to better use paying those balances off first. Also, remember that the equity in real estate carries a zero rate of return. No matter how much equity you have in your home, the value is determined by the market for homes in your area and the condition of your home compared to those homes. Whether you have 20% equity or 40% equity – the value of your home will not be impacted. If you don’t have substantial savings and investments already, and you suddenly inherited some money, receive a bonus, or a stock distribution, for example – use the excess funds to establish or feed some investment that does earn a return of some type. Investing in different assets will create more chances for your overall wealth to grow, rather than betting all on the value of your home increasing. Recasting can be used as a tool for financial planning, too. If you’re purchasing a new home and your existing home has not yet sold than you’re likely going to get a larger mortgage on the new house than you’d planned. Buying the new home first might help you get a lower price on the home and secure a lower interest rate. When the old house does close, the proceeds from that sale can be used to reduce the new mortgage. Knowing how recasting works, and when it can be useful, can help you decide if it’s right for you. It may be something you explore with your loan officer at the time you get a new mortgage. If the opportunity comes up virtually out of the blue, sit down with your financial advisor to review your best use of the excess funds before proceeding with the mortgage pay down and recast.